But in FP you don’t do this, you don’t mutate existing objects. Instead, what you do is (a) you copy the existing object to a new object, and (b) during the copy process you update any fields you want to change by supplying their new values. The way you do this in Scala/FP is with the copy method that comes with the Scala case class. This lesson shows a few examples of how to use copy, including how to use it with nested objects. Make sure your class is a case class. Create an initial object (emily1), as usual. When a field in that object needs to be updated, use copy to create a new object (emily2) from the original object, and specify the name of the field to be changed, along with its new value. When you’re updating one field, that’s all you have to do. That’s also all you have to do to update multiple fields, as I’ll show shortly. In practice you also won’t use intermediate variables with names like emily1, emily2, etc. We just need to do that now, until we learn a few more things. That’s all you have to do to update two or more fields in a simple case class. As shown, using copy with simple case classes is straightforward. But when a case class contains other case classes, and those contain more case classes, things get more complicated and the required code gets more verbose. 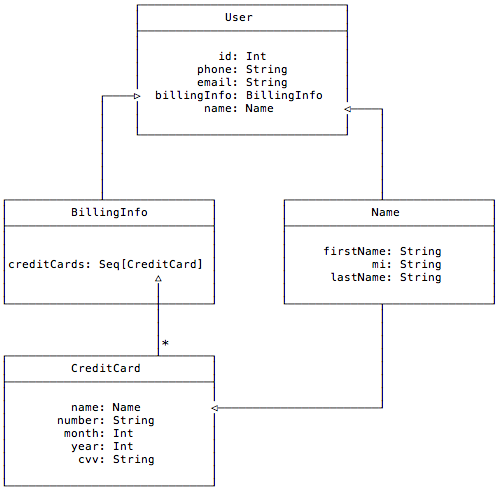 Visually the relationship between these classes looks like Figure [fig:umlRelationshipBetweenClasses]. So far, so good. Now let’s take a look at what you have to do when a few of the fields need to be updated. Next, suppose that a little while later Hannah gets married and we need to update her last name. In this case you need to reach down into the Name instance of the User object and update the lastName field. I’ll do this in a two-step process to keep it clear. You can shorten that code if you want, but I show the individual steps so it’s easier to read. As you saw, the “update as you copy” technique gets more complicated when you deal with real-world, nested objects, and the deeper the nesting gets, the more complicated the problem becomes. But fear not: there are Scala/FP libraries that make this easier. The general idea of these libraries is known as a “lens” (or “lenses”), and they make copying nested objects much simpler. I cover lenses in a lesson later in this book. Because functional programmers don’t mutate objects, when an object needs to be updated it’s necessary to follow a pattern which I describe as “update as you copy”. The way you do this in Scala is with the copy method, which comes with Scala case classes. As mentioned, I write about lenses later in the book, when we get to a point where we have to “update as you copy” complicated objects. But for now the next thing we need to dig into is for comprehensions. Once I cover those, you’ll be close to being able to write small, simple, functional applications with everything I’ve covered so far.